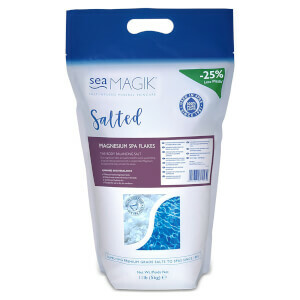 Detoxify and hydrate the skin with Dead Sea Spa Magik Himalayan Spa Salts, a pack of 100% pure Himalayan bath salts to provide a deep-cleansing and relaxing effect on the body. Himalayan salt is sourced from the highest place on earth and is unique for its pink colour and combination of 84 beneficial minerals, including: Magnesium, Potassium, Calcium, Chloride, Phosphorus, Iron, Zinc, Selenium, Iodine and Copper. Performing a detoxifying and hydrating effect, the pure salts help to soothe and relax in the bath, and can be utilised in other home spa treatments including hair masks and salt inhalation. Para um banho mineral relaxante, adicione uma chávena de sais em água quente e descontraia. Para as mãos e pés, adicione uma chávena num banho de pés ou bacia e deixe atuar. Para um efeito concentrado, adicione 2-4 chávenas num banho quente e deixe atuar durante até 20 minutos.